For a couple of hours during the early preparation for this article I was haunted by the challenge to a coffee reviewer occasioned when it looks like perhaps a whole category of coffees produced by wonderful, hard-working indigenous farmers may turn out not to taste very good, meaning the reviewer might then have to face the quality-of-life vs. quality-of-coffee quandary head on. Which is difficult to do honorably, of course, because the choice may boil down to either lying about how the coffee tastes or coming across sounding like some trivial sensory snob who doesn’t care about the struggles and aspirations of small-scale peasant producers and their supporters. Thankfully, however, the worry turned out to be a false alarm, at least in respect to this month’s Perus, Bolivias and Ecuadors. We just happened to have started with one table of five or six clearly unimpressive coffees. More tables followed, and with them an exciting showing of exceptional coffees, almost all of them produced by small-holding, indigenous farmers associated with cooperatives. So the win-win hypothesis upon which so much of the leading edge of specialty coffee today is premised, that premiums paid for quality coffee have the potential to support improved quality of life for quality-conscious producers, including small-holders, appeared to be supported once again. While, coincidentally, letting another reviewer off the hook. Not that purchase of small lots of select coffee from specific farms or terroirs at substantially higher premiums than mandated by Fair Trade is a socio-economic panacea for small-holding coffee farmers. Far from it. The practice currently affects only a tiny sliver of coffee production worldwide. Plus, if the ordinary struggles of small-holding producers were not already challenge enough, most Latin-American countries, including Peru and doubtless Bolivia and Ecuador as well, are currently suffering the worst outbreak of coffee leaf rust in their histories. Leaf rust, or roya, is a fungal disease that in the past has decimated entire coffee industries and for which there is no simple prevention or fix. The latest unprecedented outbreak in Latin American countries almost certainly is related to unseasonable rains provoked by climate change. Wet conditions promote the fungus, and heavy rains help spread the spores. But through everything the small holding farmers who produced this month’s highest-rated coffees managed to beat the odds and produce some exceptional coffees. We tested a total of twenty-nine samples, eleven from Peru, twelve from Bolivia and six from Ecuador. Fourteen of the twenty-nine attracted ratings of 90 or higher, and, again, it appears that all fourteen of these 90-plus coffees were produced by very small-holding farmers. Of the fourteen 90-plus samples, ten are reviewed here. 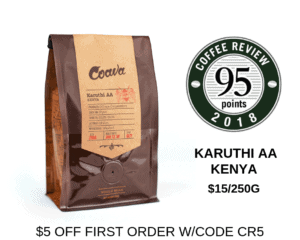 The four 90-plus samples not appearing in this month’s reviews were omitted because the relevant roasters did even better with another coffee, which was reviewed. 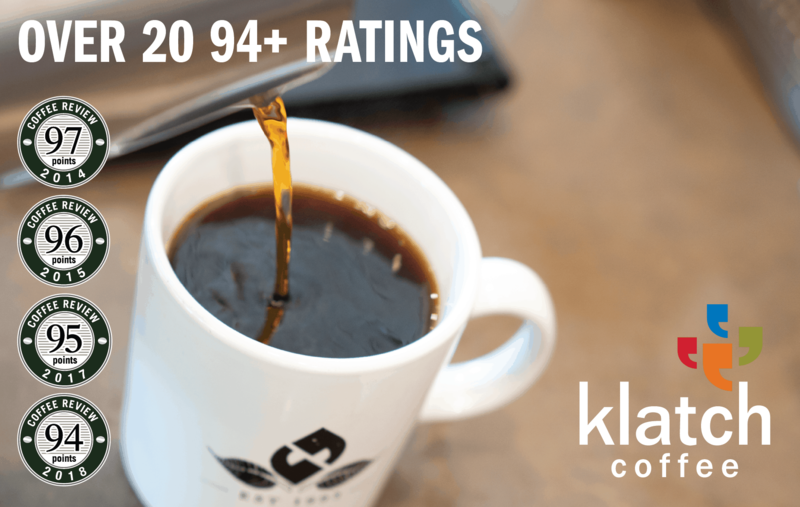 The omitted 90-plus samples include Bird Rock’s 93-rated Bolivia Carmelo Yujra Organic, Equator Coffee’s 92-rated Peru Cajamarca, Papa Lin’s 92-rated Peru Puno, and PT’s 91-rated Bolivia Tres Estrellas Eliseo Huaca. As would be expected from three origins dominated by small-holding producers, organic and Fair Trade certifications were well-represented among the twenty-nine samples, particularly among the Perus and Bolivias. Small holders typically have an advantage in converting to organic growing practices because they have been too poor to employ chemicals in the past, and Fair Trade, of course, was, and essentially still is, a certification designed to support small-producer cooperatives. Eighteen (62%) of the total of twenty-nine coffees we sampled were certified organically grown and fourteen (48%) were Fair-Trade certified. If we limit our attention to the fourteen samples that rated 90 or better, eight (57%) were certified organic and three (21%) were certified Fair Trade. What Drove the Quality Difference? Given the fact that both higher-rated and lower-rated samples came from small-holding (usually very small-holding) producers associated with cooperatives, to what factors can we attribute the often dramatic difference between those samples that attracted higher ratings and those with lower ratings? At the producing end of the supply chain the answer turns out to be the same old litany: The best samples appeared to have been produced from ripe, selectively harvested fruit carefully processed and sun-dried using traditional rather than short-cut methods. And we tested no coffees whose character was owing to a deliberate application of non-traditional processing methods. In other words, there were no honey processed coffees or dried-in-the-fruit naturals among the twenty-nine coffees we cupped. All appeared to be wet-processed, “washed” coffees in the traditional Latin-American style, although a few variations turned up: drying on raised beds rather than on patios, for example, and in one case, a Kenya-style 24-hour soaking in clean water after fruit removal and before drying. Botanical variety did not seem to constitute much of a differentiating factor among these twenty-nine coffees. Most high-rated samples were produced from trees of good- but not distinctive-tasting traditional Latin-American varieties, mainly Typica and Caturra, with an occasional appearance of Bourbon. Generally the high-rated samples achieved their excellence first and foremost through their purity, meaning a transparent reflection of the beauty of ripe fruit transposed with nuance but without distraction into the cup. An oft-noted characteristic of Peru and Bolivia coffees is their balanced structure and smooth, integrated acidity. This tendency has always been a bit of a mystery for me, since Peru and Bolivia coffees usually are high-grown, suggesting they should display a relatively intense acidity, yet their acidity typically is softer than is usually the case with high-grown coffees from other origins. At any rate, the combination of purity of traditional preparation and balanced structure tended to be the starting points for the achievement of the fourteen 90-plus coffees we tested, including the ten reviewed here. From a consuming country perspective what practices seemed to promote better coffees and higher ratings? Here again, the answer is familiar: The best of the twenty-nine samples did not appear to have arrived at the roaster via generic paths to market. They were small lots, apparently carefully selected by the roaster or importer, often but not always the result of special arrangements between roaster and the producers/exporters at origin. The 93-rated Equator Ecuador El Batan was produced by a cooperative of only twenty-two small-holder farmers to whom Equator has provided micro-loans over the past several years. The Kickapoo Peru Huabal, also rated 93, was purchased through the huge Cenfrocafe Cooperative, but constituted a very specific lot sourced only from one village of many operating under the Cenfrocafe umbrella. Both of these coffees are certified organic and one (the Equator Ecuador) is also certified Fair Trade, but the certifications clearly were just the starting point for a more rigorous selection process by the roasters aimed at obtaining not simply certified coffees, but exceptional certified coffees. The Bird Rock 93-rated Peru Raul Mamani came from a single very small farm, but it is the farm of a well-known producer whose coffee took first prize in the 2012 Peru national coffee quality competition. In contrast, the lower-rated and, in our view, less impressive samples we tested often were organic-certified and Fair Trade certified as well, yet appear, based on product descriptions (or lack thereof) to have been purchased via relatively generic paths to market. With the growing stresses of climate change threatening the very viability of many of the world’s coffee-growing regions, it may be that even the intense engagement of the growers, exporters, importers and roasters who made this month’s fine showing of coffees possible will not be enough to maintain such a high level of win-win achievement in years to come. Yet hopefully they will continue to prevail somehow in the face of the devastating challenges of climate change, the impact of which the coffee industry has only begun to experience.